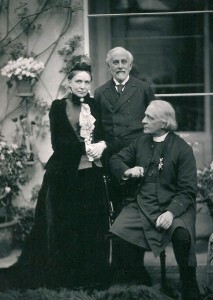 George Cubitt, the eldest son of Thomas Cubitt and his wife Mary Anne nee Warner, was always interested in the church. His father dismissed his desire to become a clergyman and set him to the family building business, but George remained interested in the church all his life and became a noted philanthropist. He married a portionless clergyman’s daughter against the wishes of his wealthy, self-made father, and built (or assisted in building) several churches, including St Barnabas Ranmore Common, with some of his huge inheritance. Born on 4th June 1828 at his parents’ home at Clapham, South London, George was christened on 1st August at St George’s Hanover Square (his father Thomas Cubitt being described as “Builder” of Eaton Place). George was sent to Trinity College, Cambridge where he gained a BA in 1851, with an honorary MA three years later. He was involved in the family building business in an area near Thames Bank where his father had workshops, and also in the development at Clapham Park. The experiment to make him a builder was patently unsuccessful, so Thomas gave in, setting his son on a political career. George became magistrate for Surrey and continued so when elected Conservative Member of Parliament for West Surrey (1860 to 1885) and for Epsom from 1886 to 1892 (after boundary reorganisation). He spoke little in Parliament unless on some church matter. In 1880 he was made a Privy Councillor, on which occasion Queen Victoria remembered his father with great affection. George was also a Surrey County Councillor for Dorking, and later an Alderman for many years. Over his lifetime he was a member of the Primrose League, a member of various Royal Commissions, the Peabody Trust, a Church Estates Commissioners, Deputy Lord Lieutenant of both Surrey and Middlesex, a founder governor of Cranleigh School in Surrey, and a Fellow of the Royal Horticultural Society. Ashcombe is the wood between Denbies and Dorking. The Bodiam connection was originally its Church, the living of which Thomas Cubitt had purchased for his daughter Mary’s husband (George’s brother-in-law), The Rev. 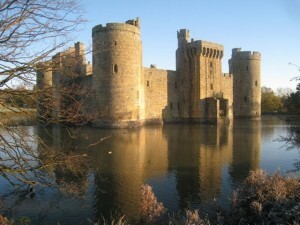 Charles Parker, but George himself bought Bodiam Castle in 1864. He continued the previous owner’s renovations and undertook repairs to the tower at the southwest corner of the site, which had almost entirely collapsed. George later refused to sell the castle to Lord Curzon, sometime Viceroy of India, but after his death Curzon bought it off his estate and began his own programme of restoration. In 1925 it was given to the National Trust, and it is such an archetypal castle in its moated setting that it has recently been voted the second most popular castle in England after Windsor. In 1853 George Cubitt had horrified his father by announcing he intended to marry the portionless Laura Joyce, youngest and very pretty daughter of the late Vicar of Dorking, The Rev. James Joyce and his wife Sarah. Thomas eventually gave way, after pressure from his younger son William (and possibly from his own wife Mary Anne), and George and Laura were married on 14th June 1853 at St Martin’s Dorking. Laura’s brother The Rev. William Henry Joyce performed the ceremony. Laura and George went on to produce nine children: three sons (of whom only one survived to adulthood), and six daughters, one of whom died in infancy. They were Geoffry George (1854), Helen Laura (1855), Mary Agnes (1858), Thomas Edmund Wilfred (1859), Adelaide Laura (1860/1), Mildred Sophia (1862/3), Mabel Georgina (1864), Henry, 2nd Lord Ashcombe (1867), Beatrice Hayward (1868) . From at least 1871 George and Laura’s London house was 17 Princes Gate, Knightsbridge. This is, ironically, not a Thomas Cubitt development, but was built by a carpenter’s son from Bedford on part of Kingston House estate belonging to the late William Hare, 1st Earl of Listowel. 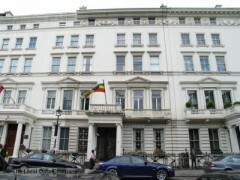 It is now the Ethiopian Embassy. Next door, No 16 is the Iranian Embassy, notable for the 1960 siege when terrorists held over two dozen hostages there for six days. When Thomas Cubitt died in 1855, his eldest son George was to inherit the Denbies Estate after the death of his mother, Thomas’ widow Mary Anne. However, it appears that George managed the Estate more or less from the beginning, and under his stewardship it prospered more than at any other time. He greatly extended the property, buying 2000 acres at Churt, Surrey, and piece by piece acquiring an almost continuous strip of land from Denbies down to Birtley Court, near Bramley. In 1883 the family estates of nearly 7000 acres were made up of nearly 4000 acres in Surrey, over 2000 in Devon and 600 in Sussex. George set out creating his model “village on the hill” surrounding and servicing Denbies and the Estate. At its maximum he was employing 300-400 people. He built about 30 cottages and various other buildings, including the Dispensary where the Dorking or Bookham doctors visited twice a week to attend the Estate employees. 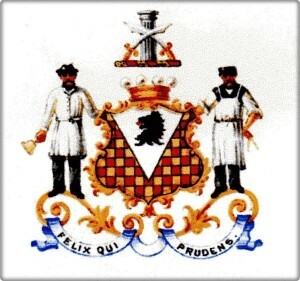 Also in the Dispensary he set up a training school for the daughters of Estate workers to learn how to be domestic servants in a great house: after twelve months, they were given uniforms and employed at Denbies Mansion or found positions in other great houses. In 1858 George, encouraged by his sister Lucy, built St Barnabas School next door to the Church, as well as a School House for the schoolteacher. The school logbook shows how benevolent he and his wife were to the School and the children of their employees: frequent visits of themselves and their daughters (often hearing lessons or teaching), an annual present of winter and summer clothes to each child, and treats such as the annual Christmas party at Denbies, complete with Christmas tree and a gift for every child. George was Honorary Colonel of the 2nd Volunteer Battalion, The Queen’s (Royal West Surrey Regiment) and he had built a Drill Hall in Dorking. He encouraged and partly financed the building of Dorking Hospital, and opened Denbies Gardens to the public. While he was MP for West Surrey, George and his wife were founders and benefactors of St Catherine’s School, Bramley, Laura donating the sanatorium for sick pupils. When she died, George erected a stained glass window to her memory in the chapel, dedicated to St Cecilia. The couple’s great great granddaughter Camilla, Duchess of Cornwall became the patron of the school. 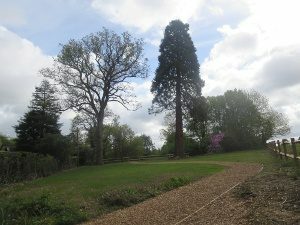 A Wellingtonia makes a striking feature in the new St Barnabas Churchyard extension created in 2015. George Cubitt also had a passion for conifers and was especially proud of his Wellingtonias, which he had planted near St Barnabas Church. 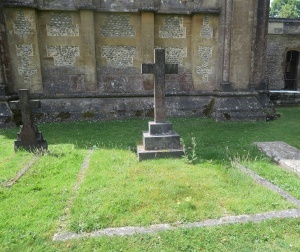 Probably one of them is the impressive specimen in what is now the new part of the Churchyard (seen in the photograph on the right). Another interest was collecting, drying and pressing wild flowers, in which he encouraged his grandson Stephen. George inherited and added to the collection of his sister Mary Parker, and ultimately acquired specimens of most of the recorded wild flowers of Britain. He left the joint collection to Stephen, who was happy to pass it on to the Royal Botanic Gardens at Kew, where it still resides. In his book “Man and Boy” Stephen writes much more about his grandfather’s character who “led a simple and austere personal life among the luxury with which fate had surrounded him, careful for those about him, and scrupulous in all his ways”. Although long out of print, the book is well worth seeking out. especially for the chapter on George, his family and Denbies: “My Grandfather’s House”. Probably the most lasting of George’s achievements was the building of the Church of St Barnabas Ranmore Common to serve his splendid Mansion and Estate. The church was designed in Early English Gothic style by the famous architect Sir George Gilbert Scott. the construction supervised by George Dines, and consecrated on All Saints’ Day (1st November 1859). 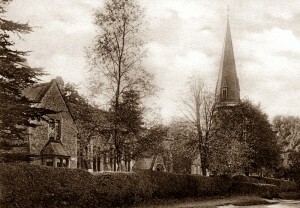 In 1860 George petitioned for a new ecclesiastical Parish of Ranmore to be created out of parts of the Parishes of Great and Little Bookham, Effingham, Dorking and Mickleham – an area of 2000 acres. George lived at Denbies until Laura died in 1904 when he handed over the running of the Estate to his surviving son Henry. Then he spent most of time at his London house in Princes Gate or at Fallapit, the country house in Devon occupied by his unmarried daughter Helen Laura, and previously the residence of his brother William. 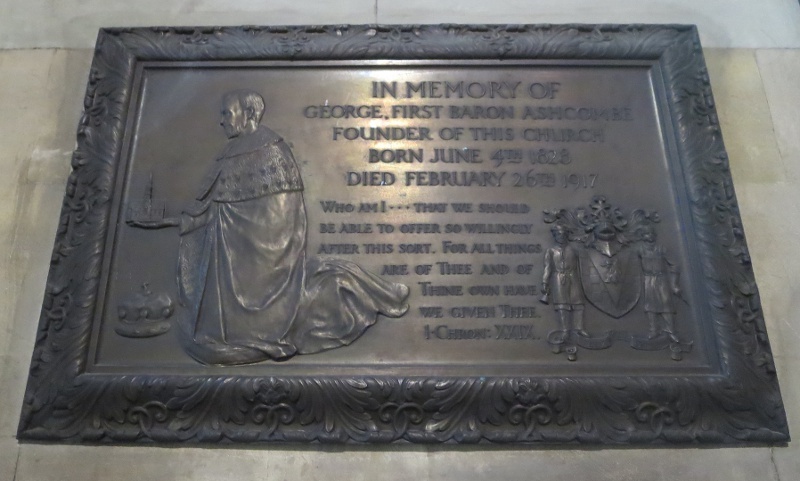 Subsequently a bronze plaque was placed in the chancel of St Barnabas to George’s memory. It shows him kneeling, in the act of offering to God the Church of St Barnabas, indeed the most lasting of all his many achievements. This is a composite list of the sources consulted for George Cubitt and all members of his family , but details for the individual family members are available if required. Most of the sources mentioned can be viewed online via Ancestry, Find My Past and Free BMD.